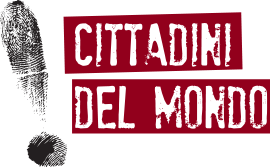 Cittadini del Mondo Onlus was founded in 2002 in order to oppose social exclusion in all its forms and help migrants to integrate into Italian society. Since 2006 the association has been active at Selam Palace, the name by which we know via Arrigo Cavalieri no.8, a building on the outskirts of Rome inhabited by political refugees. The building, which is in a decrepit condition, is home to almost 1,200 people, among them many families with children. If they have settled in Selam it is because, in spite of having their right to international humanitarian protection recognized, they were unable to find places in the public reception centers for immigrants, which are few and far between. Even though more than half of the inhabitants of Selam have been in Italy for five years or more, they live a highly marginalized existence. Over the past two years a number of problems have become increasingly acute and systemic. The most severe of these affect access to and use of public services, which are by nature bureaucratic structures not easily accessible to asylum seekers and political refugees. This has resulted in serious problems for the sick, for children and minors of school age, and for families in difficulty. Under the terms of the current project the Association will continue to run at Selam a medical and social help desk offering basic medical advice, flu vaccinations and help with accessing local social services aimed at integrating occupants into the life of the city. The Association has also established in the vicinity of Selam Palace an intercultural library where inhabitants may spend time and, together with other immigrants in the area, participate in cultural activities. The Library also hosts a social help desk for migrants, where an expert social worker is permanently available to take care of the most vulnerable cases. It is part of the Association's strategic aims to encourage Selam inhabitants to circulate beyond the confines of the Palace itself, participate in the life of the quarter and of the Library, which currently offers five Italian language courses. The overall aim of the project is to improve conditions for the reception, integration and safeguarding of the rights of inhabitants of Selam Palace and of the city of Rom who are entitled to international protection on humanitarian grounds. The specific objective is to make it easier for people entitled to international protection and asylum seekers to gain access to the national health service and the other public services they need if they are to integrate. The direct beneficiaries of the project will be the 1,200 inhabitants of Selam Palace who are entitled to international protection, as well as the other foreign nationals who consult the Association's help-desk, most of whom are entitled to international protection on humanitarian grounds. The activities CdM propose aim to consolidate the proven experience of past years practice: a social help desk will be held twice weekly at the Intercultural Library, and a social and health care help desk weekly at Selam Palace. Those in need of medical attention will also be able to attend the surgery run by the President of Association five days a week. These activities will be implemented by volunteers belonging to the Association. In the framework of this project a social worker will support the volunteer team. This expert will provide invaluable assistance in the most serious and most systematic cases of malfunction. The help desk at Selam Palace will principally address the needs of the inhabitants, while that held at the library will be open to all migrants living in the area. Last but not least, volunteers working at the help desks will accompany migrants applying for health and social services. This is proving an ever more necessary means of resolving complex cases involving especially vulnerable people. Poor knowledge of the language, bureaucratic caviling, irregular access to services due to unclear guidelines on reception, incompetence among public help-desk operators and the lack of interpreters and mediators: all these factors mean that the presence of a volunteer is often essential for finding solutions to bureaucratic problems. The project is expected to achieve the following results: political refugees and immigrants resident at Selam Palace and nearby will make use of the social and medical help-desk at Selam Palace and at the intercultural Library; refugees will be advised on the availability of the local services they need in order to integrate; refugees will be helped in completing the procedure to access to public services, for example: school inscription, health card request; the most serious cases will be identified and followed up by qualified expert; complicated cases will be accompanied to the appropriate public service; the situation as regards reception and integration will be monitored and reported by qualified personnel. Cittadini del Mondo volunteers have many years of experience in working with immigrants and political refugees, and have been involved with Selam Palace since 2006. This project would allow the association to increase the social impact of their work and, hopefully, bring about lasting change. This project received a grant for the second year in 2016.